The 2016 Bhavishya Rasi Jyotish foretells that as the scales symbolize the Tula Rashi, they crave balance above all else in 2016. They are creative and intelligent. They can be emotional but they try to be rational and practical. But 2016 will not be as peaceful for the Tula Rasi as 2015 was. Ultimately though, the good will outweigh the bad for you Libra, so you should be happy. In 2016, the Tula Rasi will start to realize that their employer doesn’t appreciate them and their efforts are not recognized. Don’t be afraid of change. If you receive a better job offer, take it! In the middle of the year there will be some troubles on the business front but by the second half of the year, you will make some progress in your career. Thula Rashi people need to have more confidence in their skills. It will help you to advance in your career. Be cautious when dealing with your boss and co-workers. Let your work speak for itself. There may be a chance for additional studies, learning or travel for your work. Buckle down and work hard and you can get through it. The 2016 Tula Rashiphal predicts that there will be much unwanted expenditure during the middle of the year as well. It will be a tough time but you will make it through and things will get better. You are in a lucky financial cycle, especially at the end of 2016. The end of the year may bring about some changes in the professional field of the Tula Rasi. You may get lucky with money and good fortune as well! The Tula Rashi 2016 astrology predictions ask you to make sure to pay attention to your family this year; someone is hiding their pain. In the spring, you will become close with someone sexually. This may be an old friend or a new friend but you will experience a lot with this person. You two will have a lot of fun and adventures that you will really enjoy. This is a good time for the Tula Rashi to get married and have kids. The Libra relationships will strengthen and deepen in the summer of 2016. Single Tula Rasi people will experience a lot of romance and flirting at this time. They may even meet that special someone when they began dating online. The Varshik 2016 Rashipal warns the Tula people to watch out for your health in the fall of 2016, an accident may occur. But it should be a minor one as there are no major health issues in the stars for Libra this year. You should be cautious in March and September 2016 that you don’t work too much or take on too much. Take this time to relax and take care of yourself. This is a good time to take on a crash course in yoga or meditation. You may feel restless around mid-October. Maybe you need to change your diet and eating habits. Try to figure out a way to relax with music therapy or crystal healing before you go to sleep. There will be much emotional turmoil going on in your life this year, so take care to keep your cool and be mindful of your surroundings. Otherwise your health is pretty good this year, so be thankful for that. Try to keep healthy by keeping active and taking care of yourself. Heating healthy food like red potato or pearl millet, healthy nuts and fruits like apricot and grapes can prove to be beneficial. 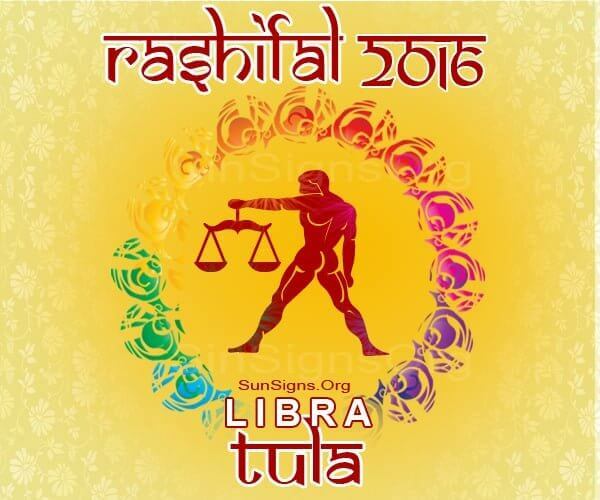 Overall the 2016 Tula Rashi horoscope forecasts a positive year if you can keep your emotions and feelings from going overboard. Keep a look out for the 2017 Tula Rashifal.